I read The End of Music shortly after reading Most Anything You Please. Both are set in Newfoundland, both involve music as an important part of the characters’ stories, and both are set (at least partly) during the war and post-war years. They share many similarities, yet are very different. Where Most Anything You Please feels like sinking into a warm peppermint-scented bath, The End of Music feels more like body surfing in the shallow waves of the Atlantic Ocean and chafing up against the sandy bottom. What I’m trying to say is that they go well together, and that you should read them both. Especially if you’re in need of some good Newfoundland Lit (which I’m sure you are, because isn’t everyone?). Throw in Michael Crummey’s Sweetland and you have the perfect trio. 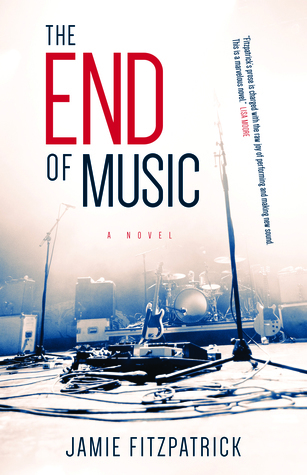 The End of Music is told in two narratives; one being the story of Joyce as she leaves home at a young age to live and work at the new airport in Gander (“a thriving hub in this new era of trans-Atlantic travel“), and the other is the story of her son Carter more than 50 years later. I’m sure this will come as no surprise, but I prefer Joyce’s storyline, most of which takes place before Carter ever comes along. After her mother dies, Joyce is desperate to get away from her father and brother, both determined to “keep her in her place”. She decides to join a friend in Gander where she’ll have more freedom at a time when young women aren’t supposed to have a lot of freedom. So nothing much has changed. A young girl was still held to account for her boyfriends, and it was treated like the only part of her story that mattered. Boys had been like that ever since Joyce was a girl, always nudging and pushing at her, this way and that. Through Joyce’s story we get a look at what life is like in the 40s, 50s and 60s of Gander, NL for the men and women working there, and as the town gets built up and families decide to put down roots. Many years later, a 40-something Carter is dealing with the imminent death of his ex-wife and former band member. They share a lot of history, but their memories of it don’t always seem to match up. He also has a mother with dementia, and a son who was born with a heart defect. When Carter goes home to Newfoundland to visit his mother, he learns that the band he played in long ago is making a kind of come-back. He and another band buddy want to resurrect it, but need to get the okay from most of the band members first, including his ex-wife who is not in favour. In the meantime, Carter has been given the opportunity to help some archeologists with exploring old crash sites around Gander airport, dating back to the war years, which tie in with events that took place when his mother worked there. It’s a rich confluence of events. Leah approaching death while he searches ancient sites of death and destruction. Carter surrounded by the trappings of flight, past and present, as he contemplates all the things that he has taken flight from. The circular route that brings him back to Gander, to the past where he once obsessively plotted the future. All this history takes Carter away from his second wife and son. He even finds himself staying away from his mother, even though she is not far away. As he finds himself living on the edge of now and then, he needs to decide where his priorities lie. You had to scratch the surface to get at the serious business of life, and people didn’t like having their surface scratched. I find this book hard to describe coherently, and I think it’s because: 1) the back and forth between the present and the past contain layers that are hard to talk about without writing an essay or giving too much of the story away. And 2) the best part of this book is not in the plot but in the details and imagery. There is a strong sense of place, and complex characters. Only a full read of the book can do it justice. 1) There’s a whole chapter in The End of Music that relates to the Hungarian refugees going through Gander on their way to other places. Volunteers helped to feed them and shelter them until they were on their way again. 2) The Kenneth Lochhead mural “Flights and its Allegories” was an inspiration to Jane Urquhart’s The Night Stages. 3) The airport in Gander is well known for the part it played in 9/11. It took in 38 aircraft carrying 6600 passengers. The population of the town was only 10,000. “There, on a Canadian island of green hills and rocky coasts, humans were at their best.” You can read a book about it. Or see the musical! I put this on my library reserve list after I read James’ review and it’s currently on my bedside table, fourth down. I can hardly wait! I love Newfoundland lit. BTW, there is an article in the current issue of Saltscapes magazine on the history of the Gander airport. Will tie in very nicely, I think. My appetite is thoroughly whetted!! Oh, that’s good to know about! Our library has that magazine – I’ll have to check it out! I’ve never heard of this book! But a “like” book to Most Anything you Please but being different yet same? Whatever – you had me at all of that! Off to look it up now! Joyce’s character reminded me of Audrey. Ha! That happens to me all the time! Too many books Naomi!! There’s just too many books!! Oh this does sound like a good read, and Gander seems like a fascinating place! I’ll confess I had only really heard about it lately with the popularity of the musical, but still, good to know it has so much rich history! Most Newfoundland books I read are set in or near St. John’s, so this was a nice change! Right! It has NOT been to Halifax! I love the sound of The End of Music thanks for the introduction to another writer I hadn’t heard of. That final fact about the Gander airport surprised me, and I feel very warm about the town now. I really, really don’t like the dual timeline thing happening in fiction right now. I can’t follow it and lose track of the context that helps me really settle into a place. I worry that it’s just me, but then I remember that I often lose track of place because a book is badly written. I like it when it’s done well (which it is in most of the books I read), but I know a lot of people don’t. Is it just me, or are a lot of books written like that now? Or maybe I just choose them because I like it? They are ALL written like that now. It’s a fad. Did this seem like a favorite book of the year to you? I’m curious if it’s that strong. It doesn’t talk about the Gander Airport in relation to 9/11 does it? I’m guessing that came way after this novel’s storyline. Crummey’s Sweetland was perfect … if it’s anywhere near that good. If I was going to recommend one to you, I’d probably go with Most Anything You Please by Trudy Morgan-Cole, which I read shortly before this one. I think it just depends on a reader’s tastes which they would like better. I totally need more Newfoundland-Lit!! I think we are doing a good job at filling each other’s TBR list!! I loved Sweetland! !